Online Adult CPR certification course content are developed by qualified team of U.S. licensed, board certified doctors. 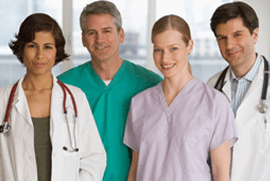 Authorized and licensed U.S. board certified physicians signed adult cpr certifications. American Academy offers adult CPR training that teaches proficient reactions in an emergency. Knowing how to perform CPR on adults is a valuable skill that can protect loved ones and provide qualification for a number of service jobs, including positions in healthcare, the police force, and education. The coursework on this site is quick and easy to complete, yet the skills gained will last a lifetime. A heart attack deprives the heart of oxygen rich blood. The U.S. National Library of Medicine states that when a person is deprived of blood or oxygen, each second counts. The internal organs, including the brain, can become irreversibly damaged when insufficient blood and oxygen flow through the body. Because the after effects of a heart attack cause so much damage, people need to know how to react when others are fighting for their lives. One way a person can help someone who is suffering a heart attack is by performing CPR for adults. Each American Academy course uses top quality photographs, CPR videos, detailed charts, and accurate images so that the full benefit of the cardiopulmonary resuscitation can be experienced without having to sit in a crowded classroom. The course covers the proper CPR steps for adults, as well as how to handle specific medical emergencies appropriately. Because all courses are created with the guidance of board certified United States healthcare professionals and physicians, they meet the guidelines for Emergency Cardiovascular Care as well as those of the Occupational Safety and Health Administration. 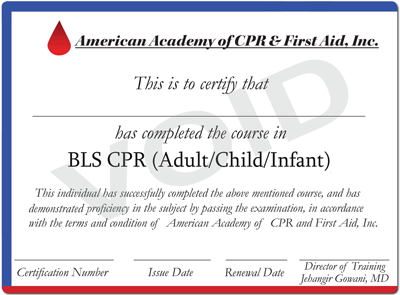 When the course is completed, and a short cardiopulmonary resuscitation exam has been passed, a certificate can be ordered or printed from the website. AED, cardiopulmonary resuscitation, and first aid. Proper ventilation for patients who cannot breathe. How to stimulate blood flow. Methods for properly clearing obstructions from a person's airway. Much more than an adult CPR review is available through the site's library of additional healthcare related courses, including handling of bloodborne pathogens , child or infant cardiopulmonary resuscitation, and first aid courses . At the end of the training, the student will learn everything needed to save the life of an adult who has stopped breathing or whose heart has stopped. It is so easy to take adult CPR training. Just follow the link below to start working toward proper certification. Simply take the free, online course and the multiple choice exam at the end. After passing a test, the member can print a certificate for just $14.99. No more waiting for test results, no more waiting in line, no more hassles - the certificate can be printed instantly, and will be valid for a full two years! How important is it to learn cardiopulmonary resuscitation? There is no better way to protect loved ones than by taking Adult CPR training. Imagine being the only person present when a child chokes on something or an elderly person suddenly stops breathing! In order to save lives, one needs a level head, an understanding of how to administer cardiopulmonary resuscitation, and the courage to put appropriate training to beneficial use. There will never be a better time than now. If certification is not needed, the course can be taken for free to learn new skills or for review. The recommendations for administering cardiopulmonary resuscitation are updated periodically, so it is always a good idea to have the latest information. It is also wise to keep skills fresh by reviewing the CPR steps for adults at least every two years. Do not wait to save lives - sign up now to get your certifications. Remember, all the coursework on this site is free, and certification is available for a low fee. Learn life saving skills that could make all the difference by signing up for an online course today! Experienced doctors who are licensed to practice medicine in the U.S. and who are board certified have written this courses content. Courses are easy to follow and designed with users in mind and certifications signed by U.S. board physician. Knowledge of cardiopulmonary resuscitation may apply to a home care agency, nursing home, or any healthcare provider. An employee expected to know how to respond to a basic first aid situation. Our certifications are recognized by most industry employers in the United States.